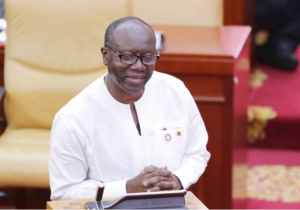 The Finance Minister Ken Ofori-Atta has hinted that the government will constitute a bi-partisan committee to probe the recent depreciation of the cedi and suggest measures to curb it. The Minister gave the hint when he appeared before Parliament on Thursday to address them. “Mr Speaker, the president has directed that I investigate the structural causes for the depreciation of the cedi and to propose measures to address the situation. The government and I will put a bi-partisan committee together to proceed immediately, ” he said. According to Mr. Ofori-Atta, drop in the cedi was not due to the weak fundamentals as suggested by the Minority stating that the fundamentals of Ghana’s economy are strong enough to support economic growth. He added that “In 2012, the cedi depreciated by 15.95 per cent, 12.81 per cent in 2013, peaked at 32.45 per cent in 2014, up to 15.68 per cent 2015 and depreciated in 9.65 per cent in 2016. It was also described by Bloomberg as the weakest currency in Africa started picking up after the sale of the $3bn Eurobond by the government. But the Minister has disputed all the claims and insisted Ghana’s cedi has performed well under the NPP.